Today is fish day. No it will not be 7 fishes, rather just one veeeery long cooking octopus. Below are pictures of what is happening in my kitchen as I write. Lightly sprinkle salt on the octopus and place it in a Dutch oven. Add the olive oil and wine. Rinse and add the parsley, stems off. Chunk the fresh tomato or smash the canned one with your hands. Smash and peel the garlic. Add them to the rest of the ingredients-or add the tomato concentrate. Season with pepper-or red pepper flakes if you want to give it a kick. Seal the pot with a layer of parchment paper and tie it around its circumference with kitchen twine. Cover tightly with the lid and place over the lowest heat your stovetop can dispense. 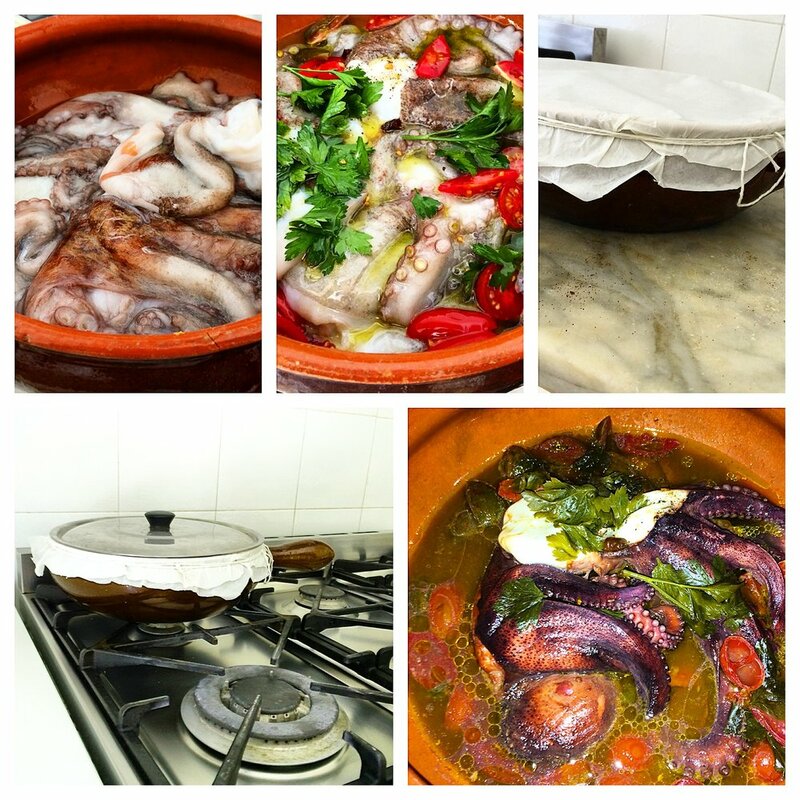 Cook slowly and lovingly for 3 to 4 hours, or more if you have a big octopus, without ever opening and unsealing the pot. Bask in the fragrance until you deem it ready. Open and drain the octopus from its water. You can serve it as is, cool it and make a salad with it, mince it for a pasta sauce. Whatever you do, keep the stock it has produced so we can use it for our days of leftover fun.